It's tough being on the road for so long. not a caption but a comment...Phil looks about as gaunt as Michael Rasmussen. "I just read our contract; we have to wear these shirts all week!" That's a wide angle lens that's unflattering as can be. "I just love that vibrating tounge ring"
Psst, Hey man, I just remembered, those *****s...I forgot to dump their bodies. "No more haggis for Paul!!!" I just heard Armstrong is buying the network. 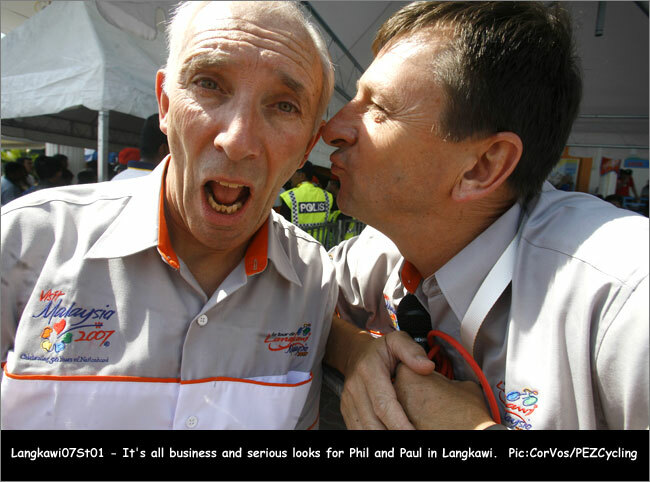 So Phil....how does Elisa Basso keep from getting caught with Ivan's EPO? Paul: "Hey Phil. You know Africa gets lonely in the winter". I still can't come up with one. Too much elderly british man-love going on for me to focus. Dude, your breath is so bad I can smell it through your ear hole. How can you have your pudding if you don't eat your meat?!? "Hey, I thought it was my turn to play Cipo and your turn to be the podium girl!"